Queensland Museum & Sciencentre and Queensland Air Museum will appeal to museum buffs. Get outdoors at Lone Pine Koala Sanctuary and Scuba & Snorkeling. Venture out of the city with trips to Maleny (Obi Boardwalk, Mary Cairncross Scenic Reserve, & more), Australia Zoo (in Beerwah) and Montville (Artworks in Clay by Anne Gentry-Smith, Kondalilla National Park, & more). Spend the 23rd (Sat) exploring nature at Glass House Mountains National Park. Spend the 29th (Fri) observing fascinating marine mammals with a dolphin and whale watching tour. There's much more to do: walk around South Bank Parklands, enjoy the sand and surf at Kings Beach, identify plant and animal life at Point Cartwright, and admire the masterpieces at Queensland Art Gallery. For other places to visit, more things to do, ratings, and other tourist information, read Brisbane trip website . Algiers, Algeria to Brisbane is an approximately 28-hour flight. The time zone difference when traveling from Algiers to Brisbane is 9 hours. While traveling from Algiers, expect a bit warmer days and warmer nights in Brisbane, ranging from highs of 32°C to lows of 23°C. Cap off your sightseeing on the 2nd (Tue) early enough to go by car to Gold Coast. Appreciate the collections at Tweed Regional Gallery & Margaret Olley Art Centre and Thomgallery. Step out of the city life by going to Surfers Paradise Beach and Currumbin Wildlife Sanctuary. Venture out of the city with trips to Watersports Guru (in Kingscliff), Whian Whian State Conservation Area (in Whian Whian) and Byron Bay (Cape Byron Lighthouse, Jules Hunt Studio Gallery, & more). Spend the 10th (Wed) wandering through the wild on a nature and wildlife tour. Spend the 19th (Fri) exploring nature at Les Rodgers Memorial Park. There's still lots to do: look for all kinds of wild species at David Fleay Wildlife Park, observe the fascinating underwater world at Sea World Theme Park, take an in-depth tour of Templin Historical Village, and find something for the whole family at Warner Bros. Movie World. To see maps, reviews, photos, and more tourist information, refer to the Gold Coast online sightseeing planner . You can drive from Brisbane to Gold Coast in an hour. Other options are to take a bus; or take a train. In April, daytime highs in Gold Coast are 30°C, while nighttime lows are 19°C. Cap off your sightseeing on the 19th (Fri) early enough to travel to Sydney. Museum-lovers will get to explore Australian National Maritime Museum and Justice & Police Museum. Get a sense of the local culture at The Rocks and Art Gallery of New South Wales. Get out of town with these interesting Sydney side-trips: Wentworth Falls (in Katoomba), The National Pass (in Blue Mountains National Park) and Norman Lindsay Gallery & Museum (in Faulconbridge). Spend the 28th (Sun) exploring nature at Sydney Harbour National Park. Spend the 30th (Tue) exploring nature at Berowra Valley National Park. The adventure continues: tour the pleasant surroundings at Bondi Beach, enjoy some music at Sydney Opera House, explore the world behind art at White Rabbit Gallery, and see the interesting displays at Hyde Park Barracks Museum. To find ratings, other places to visit, more things to do, and other tourist information, read our Sydney tour planning site . You can fly from Gold Coast to Sydney in 3.5 hours. Alternatively, you can do a combination of train and flight; or drive. 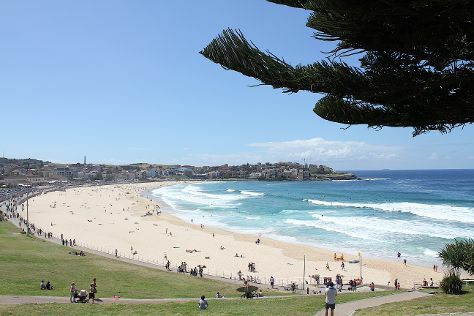 When traveling from Gold Coast in April, plan for a bit cooler days in Sydney, with highs around 26°C, while nights are about the same with lows around 17°C. Cap off your sightseeing on the 1st (Wed) early enough to travel back home.